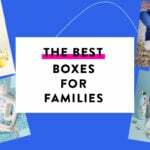 Ecocentric Mom August 2017 Spoilers + 30% Off Your First Box! We have spoilers for the August Ecocentric Mom box! Plus, use coupon code BATHTIME to save 30% off your first box! The theme for August 2017 is “Baby Bathtime Box”! The Products: Green/organic beauty/health/house/baby items. Check out all of our Ecocentric Mom reviews and the Moms Subscription Box Directory!